An Andy Wylie picture, date estimated, sent on by Alan Hale. These pictures show the changes at that corner since 1962, when picture #293 was taken, and are collected together in their own group. This one shows the building on the corner (what was it) being demolished to make way for the building that preceded the current Kiln Corner housing and office development. In answer to the (what was it) question regarding the building on the corner. It was occupiedat one time by Bill Leonard as a bicycle repair shop. Prior to this I believe it had something to do with an oil company. Anyone out there with any more information on this one? 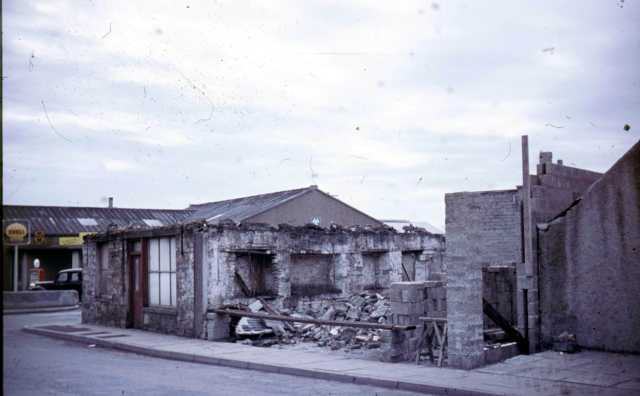 The building on the corner was the premises of Leslie and Leonard, Motor and Cycle Engineers, one of the earliest garages in Kirkwall. I have a copy of a picture of it taken before the First World War showing the staff lined up outside. I'm asking the owner of the original for permission to post it. The oil store was next to the garage. It was operated by brothers Davy and Billy Peace, who used a horse and cart to deliver barrels of oil. I seem to recall my uncle referring to it as Walter Leonard's Garage before it was knocked down in early 60s. It was set up by Tom Leslie and Bill Leonard after WW1. In 1940 Bill's son Walter was exempt from school at thirteen to serve his time in the garage as his elder brother Leslie was called up for Army service in North Africa. He often said that if he didn't pay attention his old man would rap him across the shoulder with a hammer handle. I can't see modern day apprentices putting up with that kind of treatment. I'd love to see it Kay, I have a newspaper clipping from the Orkney Herald (April 1961), which may be the same photo. The building that was demolished was Harry Cordock's radio shop.